I didn't search through this thread, but the confederation mall in Saskatoon is about as dead as it can get. Calling North Hill (Cgy) a "dead mall" is one of the silliest things I've ever read. This person obviously has no idea what a "dead mall" looks like. North Hill has constant traffic. it is no Chinook but it's incredibly far from "dead." Google Woodmar Mall, Hammond Indiana (my teenage stomping ground) if you want to see a dead mall. 2) Transcanada Mall: 16th Ave and 52nd - KMart closed, mall was demolished and replaced with a Safeway. 3) Mall in Thorncliff along Centre Street. Used to have a Zellers. 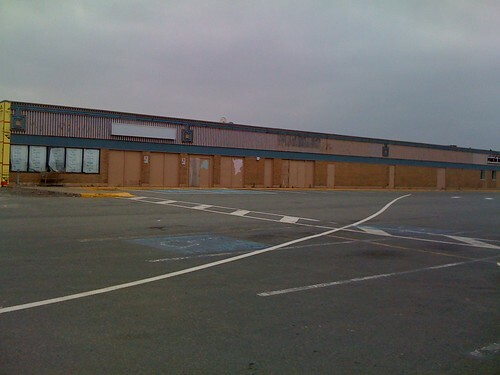 Was demolished and replaced with SuperStore. Calgary probably has the fewest dead malls in Canada because it never really had that many to begin with and strong population growth has ensured continued demand. London has got to be the worst. I can think of so many malls that were bustling when I lived there in the late 80's that are gone now. Of course, London also had a crazy number of malls for its size. Quoted for truth. I STILL think Calgary is underserved by large scale retail compared to most Canadian cities of similar size, and that's after we saw a completely new mall (CrossIron Mills) plus major renos and expansions in the past 5-7 years (Market Mall, South Centre, Chinook, The Core). When you add in the continual population growth and the sheer excess of disposable income here... it's sick. Mind you, a lot of the excess consumer demand is taken up by the ridiculous amount of big box that's going up everywhere. But yeah. North Hill is a quiet, "locals" mall at worst. It may be the closest thing to a dead mall Calgary has, but that says more about Calgary than it does dead malls. Northland is in a similar category if you ask me. I was there at 4pm on December 24th and it still felt empty - but hardly dead. If it wasn't located in a "communist" state, though, it wouldn't get upkeep. Surely, they'd have given up by now? Well I was there around a year ago, and they were about to tear down the confederation mall and destroy it because walmart was leaving. And by the looks of it, half of the mall was vacant. Guess it changed. Probably not mentioned, but my home town of Camrose, AB has Duggan Mall which is all-but dead. Still has Zellers for an anchor store but other than that it's pretty quiet. A large power center opened just west of the mall which sealed it's fate. The same seems prevalent in other small central Alberta towns like Wetaskiwin and Airdrie (I believe the Airdrie mall was demolished). It seems Calgary has a small amount of enclosed shopping malls but they LOVE their power centers. Is it true that Signal Hill Shopping Centre was originally supposed to be an enclosed shopping mall? That's one of the few Zellers locations that is attached to a power center instead of a mall. I always thought Deerfoot Mall is quieter than North Hill. Perhaps Deerfoot Mall may be the most vulnerable of all Calgary Malls, now that Crossiron Mills has opened. Calgary: more than just a redneck city...much more. Just ask the mayor. In Campbell River there is the Campbell River Common which used to be called Ironwood Mall. It's pretty sad. A couple of years ago they tried to resurrect the place but it didn't work. Recently the Sears appliance store moved out of the mall. It was where the old Safeway was. Currently there is a Dollarama, Bootlegger/Ricki's, Northern Reflections and Thrifty Foods. It's a pretty sad mall and I think that it's not going to last very much longer. New owner and new management can make a huge difference to a mall. In fact all the enclosed malls in Saskatoon are doing well with the exception of a smaller one or two in the downtown. I think the Sturdy Stone Center is a bit sluggish. Cavendish mall in Cote St. Luc...I remember it well. Was thriving in the 70s-80s, then Eaton's died. The cancer crept up the mall. Time to slice the dog turd in half. Cavendish mall used to have legendary-bad commercials ad nauseum on CJAD 800 radio in Montreal. Penhorn in Dartmouth seems to be pretty dead. It's amazing that old relics like these are still standing. You'd think they'd be prime targets for redevelopment if they haven't been swept up by the call centres and discount emporiums. 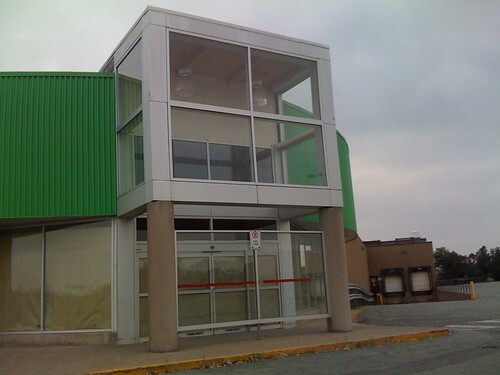 The Village mall in St. John's is dying a slow death. It was on life support for a while but some new stores have moved in recently and the Sport Check that has been in there for probably a decade has moved into the old Sears location, expanding their store by atleast 50%. There are still a good few vacant stores and I doubt that many of the stores that are in there will be able to survive. The mall is suffering because of the big box stores and because of the larger and more popular Avalon Mall. The Wal Mart in the Village moved to a bix box store development several years ago which wasn't good for the mall but the Wal Mart and the supermarket that were in the Avalon Mall also moved out and this ended up being worse for the Village. With the Avalon Mall having two large spaces open up both Sears and Winners, which also had locations in the Village, moved in and it wasn't long before they closed their stores in the Village. Sears and Winners were the two big attractions for the Village and with them gone the vast majority of the stores that were left there were all in the Avalon Mall. The mall was sold a few years ago, it may have been sold twice in recent years, and the new owners brought in some different sotres but it hasn't made much of a difference. How about a mall that has never had a single tenant in its entire history? I present 104th Avenue Centre in Surrey, BC. It has been empty for 13 years, never had anyone occupy the building, and is owned by some investor in Arizona. It apparently accounts for so much of the vacancy rate in the city, that it is no longer included in the annual vacancy rate listings. It started off life as the Asian Mall for Surrey and was about 80% leased... until the developer went bankrupt. It was bought out and finished, but many of the tenants moved on to other sites. It is in immaculate shape. There was a mall with an almost similar fate in Montreal along Decarie expressway. The whole thing became a massive call centre. They already tore down half the mall. I drove on Cavendish for the first time in a while a week ago, it was an odd feeling seeing nothing but rubble. I present 104th Avenue Centre in Surrey, BC. Looks like a high school. If only Highschools were designed like that. Many of the suburb schools have horrible designs for the buildings. Burnaby probably leads the list with the largrst numbers. Vancouver is ok because of the older buildings, but some newer buildings from the 70's are pretty bad aswell.